It's been 4 years today that Dad left us. As with any death, in some ways, it feels like just yesterday and, in others, it seems like an eternity. Mom came to live with me the day after he died so life has moved on for me with barely a pause. Mom and I have had quite the journey - mostly a learning experience for both of us. In the past 4 years though, my Mom has taught me about how to age with humor and grace (mostly!). Through our trials and tribulations, I've become quite the little (?) caregiver and she's become quite the little patient. We speak of Dad very frequently and, in some ways, it's like he's right there with us. We remember his humor, his warmth and his love. We remember how he delighted in my dog Killian; how he would sneak food to all of the dogs and then lie and say that he didn't do it - but his body language would always give him away as his shoulders started to shake when he tried to hold in his laughter. I've been very blessed with the best parents of anyone I know. They raised their children the right way - we all made mistakes along the way and my folks were always there to lend their support. I think that one of their best parenting skills though was preparing us for life in general. They did this through example - they handled adversity with a grace rarely seen today. They also taught us that life is full of great joys and deep sorrows. They taught us that the key was to enjoy the joys, respect the sorrows, and keep moving along whichever path we chose. Thank you all for joining us today to celebrate the life of Joe Burdoo. I say celebrate as we spoke many times about the ultimate end of life. Dad didn’t want a pity party, he just wanted a party. Period! And, that’s what we’re going to try to do. This is singularly the hardest/easiest speech I’ve ever given – it’s hardest as the circumstances are obviously difficult. It’s easiest as I get to teach you about a passion of mine, my parents. This is not so much a eulogy as a celebration of love. While Ronnie and I were flying to Arizona to meet up with Mom and Mike the day Dad died, I started jotting down memories we both had of Dad. We filled 17 pages before I stopped writing. How many people in your life can fill 17 pages without a conscious thought? 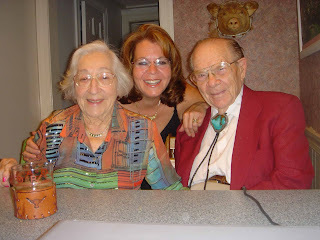 And, I found that it was difficult to separate the ‘Joe’ from the ‘Gertie.’ You’ll hear me speak of both of them a lot during this eulogy and in life in general – that’s what Dad’s life was, A Joe and Gertie Story. Dad was born in Kansas City, MO in 1917. He was the youngest son born to a family with 2 girls. Aunt Gertie was 9 years older, Aunt Molly 7. Dad told stories of Aunt Mollie pinching him awake as a baby as he had taken over her baby spot and was pretty good at it at that. She didn’t much care for the switch in positions. 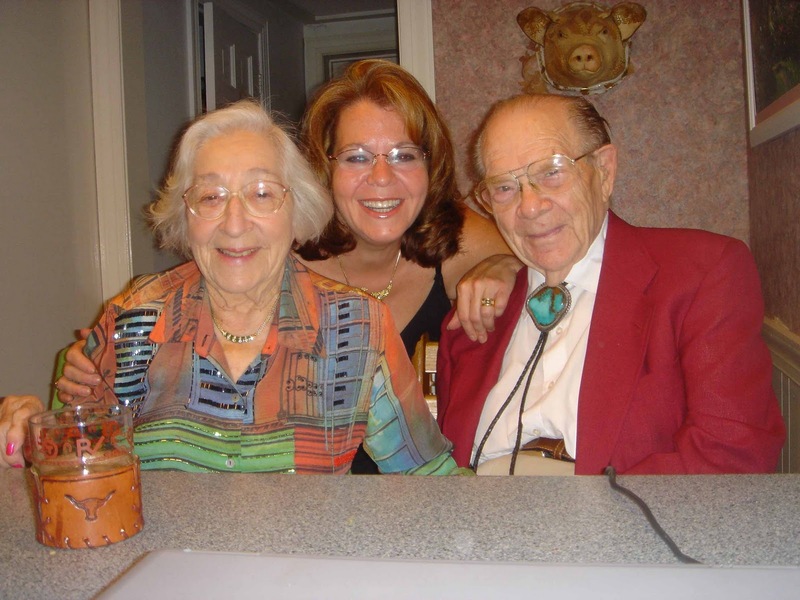 Aunt Gertie was a second mother to Dad and their bond was evident throughout her life. We lost her in 1976. She was an amazing woman who still holds a powerful influence in my life. Dad’s other sister, Aunt Mollie, died in 1990. Dad met my Mom’s brother, Al, first. Al invited Dad on a hayride to be a date for his sister ‘with the good personality’ (that would be my dear Twin B). Mom and Dad hit it off although she reports that he didn’t kiss her for ages (he was shy). They dated for 5 years at which time Mom gave him the ultimatum and damned if he didn’t marry her! Dad worked as a shoe salesman, in Kansas, to make ends meet. He started off at something like $12 a week. The company promoted him to manager but he was shipped off to fight in WW2 so had to decline the position. WW2 found him starting off as a cook which has always interested me as he was no cook. He found himself then driving a tank (that one I got as that man could DRIVE!). He fought in the Battle of the Bulge and helped in freeing the Jews in a concentration camp in Germany. He wouldn’t talk of the war except to share one story about having to pee on his gun to keep it from freezing. We asked but he couldn’t talk about it. After the war, he returned to Mom and baby Mike who wondered who that man was who was hugging his Mommy. Aunt Gertie and her husband had settled in DC so off he and family went. He and Mom ended up owning a grocery store in SE. Ron and my dear sister, Stephanie, were born during these years. Stephanie died suddenly in 1989 and Dad started to show us the wisdom of his years. He and Mom faced that trying time with grace, humor and a fierce need to stay connected to family and friends. He shared that passion thoughout his life. Dad was the original family man. He owned a bunch of businesses: there was the Springhill Lake Hotel, Redskin Lounge with shady characters, Birdland, and finally, Town Hall which he bought in 1959. He was very proud of Town Hall. He and Mom surrounded themselves with some colorful locals who repaid him by ‘having his back’ when needed. The locals loved him and my Mom. They still ask about my folks frequently. Town Hall has closed 4 times, willingly, since Dad’s owned it. It closed when his mother died, it closed when Aunt Gertie died and it closed when my sister died. It’s closed again today in respect for its founder. When Aunt Gertie was ill in Florida one time, Dad and I decided to drive down as we’d get there quicker than the earliest flight the next day. Dad was driving through Georgia cresting a hill at 100 mph. I had just begged him to slow down but he was going to get to his sister if it killed us. Well, sure enough, he gets pulled over by a cop (who I secretly prayed for). The cop comes up to the car, takes Dad’s license and goes back to his car to run the check. Walks back over, and says to Dad ‘Are you the Joe Burdoo from Town Hall? I went to U of Md. I remember you.’ Dad got off with a warning. I was bummed. Dad had triple bypass in 1981 when it was really a state of the art surgery. They told us that he’d have about 10 years left – he was only 64. He lived another 26 years. And, he LIVED those years. My parents became free spirits after his heart surgery. They came out to Arizona to visit 4 of Mom’s siblings who had settled there after retirement. My brother Ron says that those Jews had finally found their desert. They came back to the house in Rockville to tell me that they bought a house in Sun City. I said ‘GREAT, when are we moving?’ They said ‘WE’ weren’t moving, they were. I consider that the first known case of the parent birds leaving the baby bird in the nest. They started to travel. 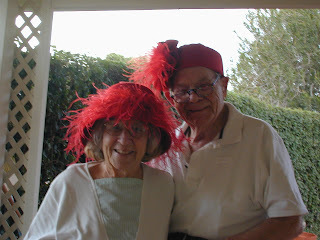 They took world tours with Aunt Gertie to visit relatives in Israel, went to Egypt, Russia with Mom’s brother Al. They were movers and shakers. They took the whole family and an extended group of friends on cruises to celebrate their 50th, 55th and 60th. Last year, we didn’t do an organized 65th cruise but Ron, Linda, Dan and I went on a cruise out of Baltimore with the folks and people still recognized him! We ended up sitting at a dinner table with one of his old bartenders. He was loved by many. 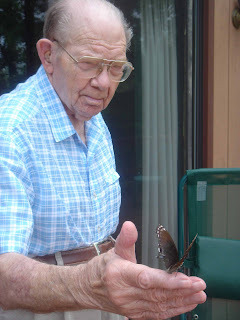 Dad always took care of those he loved. 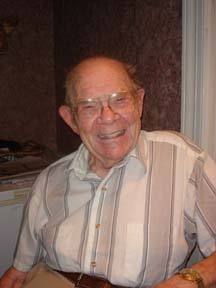 He cherished my sister and always made sure that she and her family had everything they needed. He doted on me. I had to be careful about saying that I liked something as I’d generally find it parked in my driveway shortly thereafter. I’m the grateful recipient of the pimpmobile – his old Lincoln which I love. He loved Mike and Ronnie and never stopped talking about his grandchildren. Dan and I have had the extreme honor of hosting my folks during the summer when they come to live with us. I’ve had the unusual pleasure of being able to relate to my parents as adults – to have them teach me about growing old with grace and humor, to love and be loved, to surround oneself with happiness. Dad really loved our cabin in West Virginia. He would eagerly get in the car and just enjoy the ride. That was pretty much his motto – enjoy the ride. Even when he was coated in dog hair, grungy from picking tomatoes in the garden, he enjoyed the ride. 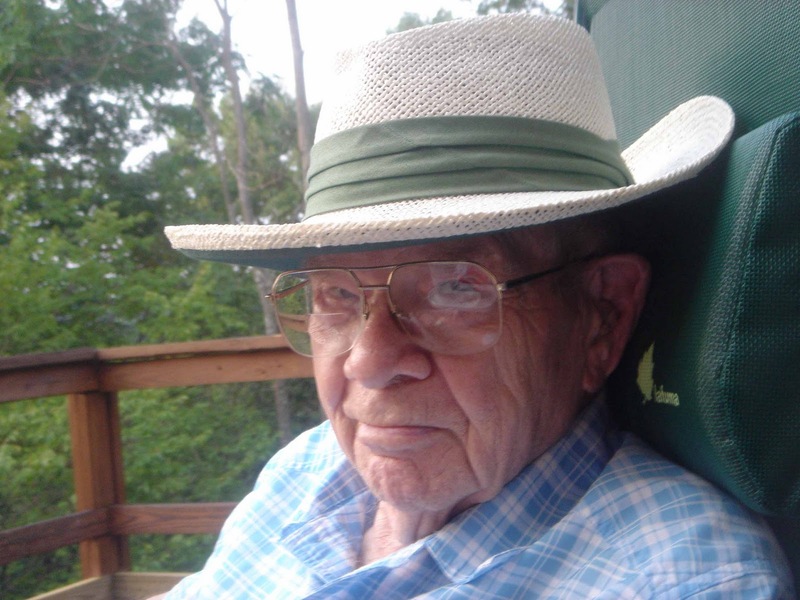 We’d stop and get an apple pie for the road – he loved his apple pies. We’d stop and get lunch on the way and eat in the car (generally with Barley drooling all over him – he’d just wipe it off and grin), just watching the sleepy town go by. 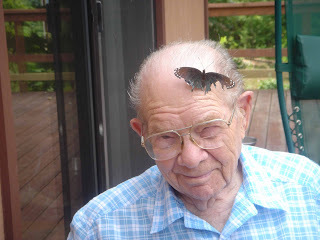 Eventually, we’d wind our way to the cabin and he’d generally be found on the deck – under his hat, fast asleep. Cocktail hour was always fun up there. We’d have drinks and just sit around the table and talk. Night time would find us gazing up at the bats eating the moths. We’d watch that activity for hours as the sun set over the mountain. Dad’s eyes last time I saw him, last month, were still young. Still vibrant blue, still interested in the cards he was dealt – literally, as we were in Laughlin just last month. The dealers loved him there. One of my favorite memories was just from that trip. I was at the craps table as is my wont and I heard Mom’s giggle across the casino. My first though was ‘uh oh, what are they into…’ I went over to the blackjack table where they were seated to find them laughing and whooping it up with 2 gentlemen from New Jersey. These gentlemen had just fallen in love with my parents. I mean, they were in LOVE! Mom and Dad embraced them right back – regaling them with tales of life in general. We played cards with those guys for 4 hours or so. They told me repeatedly how precious my folks were, how lucky I was to have them, how vibrant they were. Dad would gamble $100 a card on blackjack but grumbled about $2/lb tomatoes. Dad’s trickled his gambling fever into every day life. Summers would frequently find Dan, me, Mom and Dad sitting on the balcony of our house gambling about what the next car to come down the street would be. Blue, red, driver’s window open, elbow out (that was a 20-1 shot) and damned if I didn’t constantly lose. We’d have frequent poker games in the dining room, sometimes just the 4 of us, sometimes other suckers would wander by. The end of the summer would usually find all of us light in cash except for Dad who almost always won. Dad got a kick out of the constant flow of dogs through our house. We not only did rescue, but we served as an informal dog park to our friends and their canine buddies too. Dad was always worried that one or two would stay. We have 3 dogs – all of whom drool when they see the folks. Killian, our aussie, was the most attached as Dad would sneak him food. I’d tell Dad not to do that, he’s promise me he wouldn’t, and, the very meal, there was Killian, gazing adoringly at Joe again, eating something my Twin A had sneaked to him. Dad’s whole body would rock with laughter when I’d catch him doing it again, and again, and again. I put my Twins on a plane last December to come back to Arizona for the winter and knew I should have ridden along. But, it was a non-stop, I felt the risks were small and Mike would be collecting them on the other end. Well, Mom called me from Chicago (CHICAGO !) to tell me that they had to have an emergency landing as a gentleman got sick on board. When the plane landed, the pilot’s seat broke so they were stranded in Chicago for about 8 hours. Of course, I was in a total panic as my twins were on their own – but not for long. The stewardess who had been serving them called me to tell me how delightful they were – how she was going to get them lunch and drinks and would check on them every 30 minutes. She arranged for my cousin and her husband to get through security to sit with them. She called me once to tell me that she wished the younger passengers would take a cue from my folks as they were just taking the journey in stride. That’s my parent’s secret – it’s the journey, not the destination that matters. Life is all about the journey. I called the hospital last week and was lucky enough to talk to the nurse taking care of Dad. He told me that Dad was the nicest, easiest patient he’d ever cared for in his 17 years experience. I heard these types of comments all the time – how wonderful my parents are. Luckily, I don’t believe we’ve ever taken the folks for granted. Just looking around, we can see how lucky we all are. We’ve always told them we loved them – they were not in doubt of our adoration. I remember one time, I was in Arizona lying in the back bedroom about to go to bed. Dad was watching the news on the big tv in the living room, Mom went into their bedroom to watch another channel. I heard them arguing briefly and thought ‘wow, a heated argument! Better listen in!’ I hardly ever heard them bicker. This ‘argument’ though was amazing to hear. Dad had turned off the tv in the living room and gone into the bedroom where Mom switched channels to what he had been watching. He was arguing with her about her turning the channel to what he wanted to see! He said that she should watch what she wanted, she said she didn’t care, they’d watch what he wanted. They were arguing about who was the less selfish. That was the story of their life – he thought about her first and foremost, and, in turn, she thought about him first. That was one secret to their 65 1/2 year happy marriage. The fact that we were lucky to have Dad and Mom has never been lost on me, or Ron, or Mike, or the married-ins. We’ve had an incredible streak of luck, we’ve had parents who love and totally cherish us, we’ve had parents who allowed us to make our own decisions and sometimes fail, parents who supported us through heartbreak, parents who loved us unconditionally. We’ve had the parents that others dream of and, in fact, most of my friends have asked to be adopted – some of them pretty much have been. Dad has shared his wisdom with many of my friends and they mostly have listened. Dad came home to Maryland only once alone – he never did it again – to visit his parent’s graves, my sister’s grave, and his sister’s grave before the Jewish holidays. He left his bride back in Arizona so she didn’t have to make the hard trip. Although he was coming home to a home he shared with Dan and me and Mom, he was lost without her – it was obvious in his twice daily phone calls back to Arizona to tell her he loved her. I drove him around to the graves and, when taking him to the airport the next day, he asked me to stop so he could get some flowers to take home to Mom. He’d been gone 2 days but wanted to bring her flowers. He couldn’t wait to see her. Dad kissed his bride every morning and every evening he was able for 65 ½ years – their signature line with the kiss was ‘good morning, sweetheart’ or ‘good night, sweetheart.’ I witnessed him getting out of his bed one night because he had forgotten to kiss her and wanted that last kiss for the night. It was a thing of joy to see him excited to see her, every single morning. I walked in on them one time when they were sitting on his bed, holding hands with their backs to the door. I was interested to find out what they were doing. Dad said, just talking. I said, about WHAT? He said, just talking about our day. That’s what they were doing. Just talking. Even though they had spent every single minute of the day together – they were just talking. I walked in another time when they were sitting on the bed with their hands in fists and grins on their faces – they’d been caught doing something but I didn’t know what my Twins had been into. I told them that they were caught so they might as well fess up. They opened their hands to show me treasure troves of jelly beans in each fist. They’d bought 4 lbs. of jelly beans at Costco, hid them in their bedroom and had been feasting on them nightly before bed. Those are my Twins. We’ve had the best and we know it. We still have the best. We still have a very strong mother, we still have a very strong father who, although not with us in body any longer, is still a guiding force. A father who taught us how to live, and how to die, with dignity all the way. Sadly, Dad didn’t get to see his newest grandchildren, Nora Grace or Lane, but I see him every time I look at them. Dear Nora Grace has his crystal blue eyes and his nose. She’ll be surrounded with stories and will grow up knowing her Zaide even though he’s physically not with us any longer. With any luck, she’ll have his grace and love of life also, and, with some guidance, she’ll also learn the secret of a long, happy life. That’s my wish for all of us. Take a lesson from my dear Mom and Dad. Live and love the journey. Die happy and you’ve won. Dad has had his final big win. My father lived 89 ½ glorious years. He got sick, went to the hospital and died. I consider that a success. That was a success. Thank you all for coming to celebrate the life of our delightful father, the love of my mother’s life, and our very dear friend. We’ll miss him terribly but we’ll carry on his passion for life. We’ll give it our best shot. Aww, how sweet. What a good daughter you are. I love the photos and your sentiments. Lori you've told me so many wonderful tales about your parents and of course I know and love your mom but this tribute to your amazing Dad brought me great joy and hope on a hard day and I thank you for this reminder of how to live. Thanks everyone. It's very easy to write about my folks as they really are my passion. Wonderful Blog Lori, I really enjoyed reading. Well, it is Saturday, and my dad's funeral was a week ago. This blog is a great thing to read, and a good idea for me also. You brought some of your dad to your readers. What a blessing to have so much love.